This, my friends, is where the bat brownies come in.They’ve already passed the litmus test of my coworkers, one of whom was driving out of the parking lot while I walked into the building carrying my plate of bat brownies, and started to honk her horn, roll down her window, and scream OMG ARE THOSE TREATS DID YOU BRING TREATS CAN I HAVE ONE!? 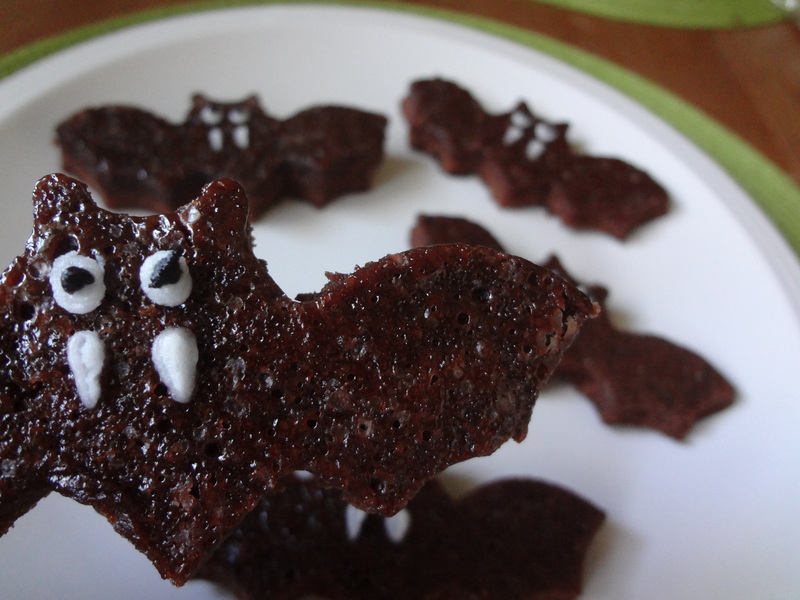 Even from afar, these bat brownies impress. Once I finally got the brownies in side, and situated on the counter of the staff kitchen, they flew (ha!) off the plate. Everyone who walked by thought they were utterly adorable, and I just giggled to myself that their enthusiasm was won with so little effort on my part. So, never again do you need to fear the last minute party invite! These fast and easy treats are sure to impress, leaving you stress free and ready to party. 1. Preheat your oven to 350 degrees. Prepare the brownie batter as instructed, and pour it into a greased 10×15 inch baking dish with a rim. 2. Bake for about 10-15 minutes, rotating about halfway though. 3. Let it cool completely while you piece together your amazing costume. 4. 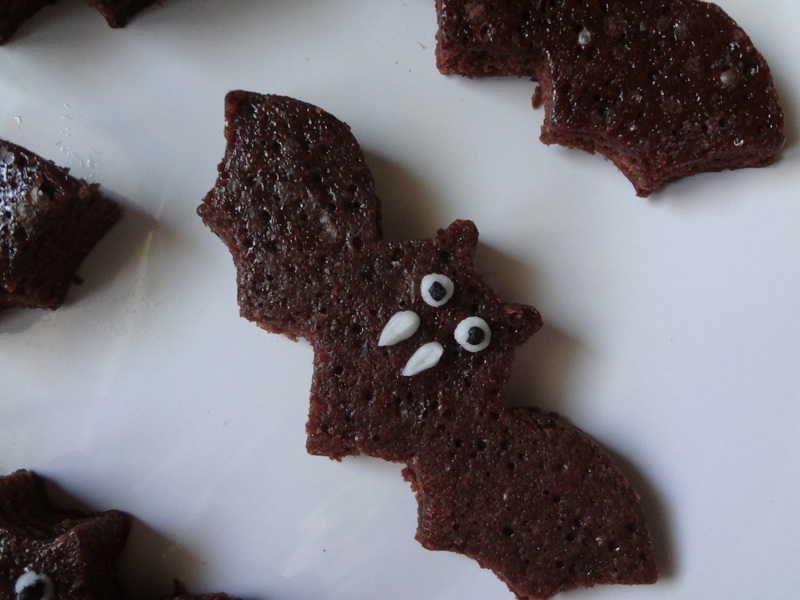 Once the brownies are cooled, use your bat-shaped cookie cutter to cut out your bat brownies. The easiest way I’ve found to remove the bat shapes is to gently peel away the excess brownie, and set it aside…or eat it. Your choice! 5. Once your bats are free, just pipe on eyes and fangs, and you’re all set to wing it (couldn’t resist) to the party. 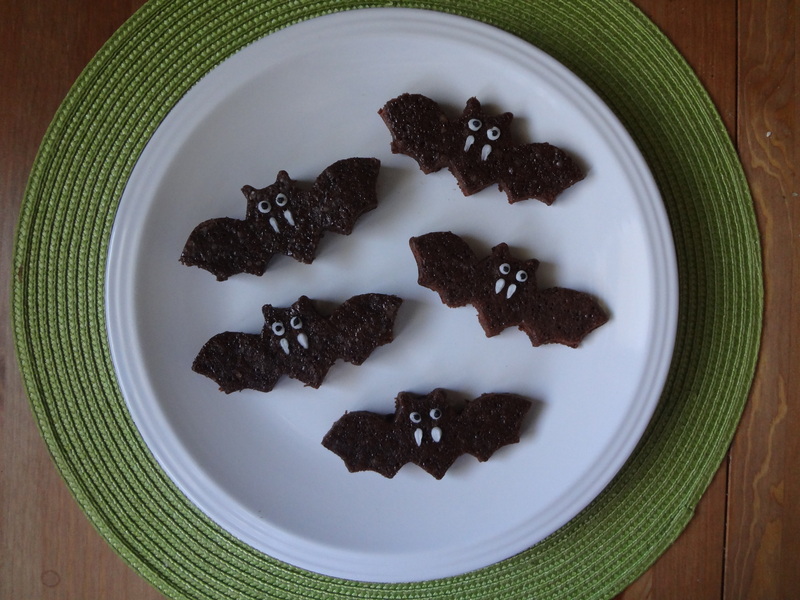 This entry was posted in Uncategorized and tagged bat brownies, bats, Brownies, Chocolate, fast and easy, Halloween, Halloween treats, Holiday, Party Food, spooky foods by theculinarycapers. Bookmark the permalink.